Key West is known for its miles of pristine beaches, but where to start in this beautiful resort town? 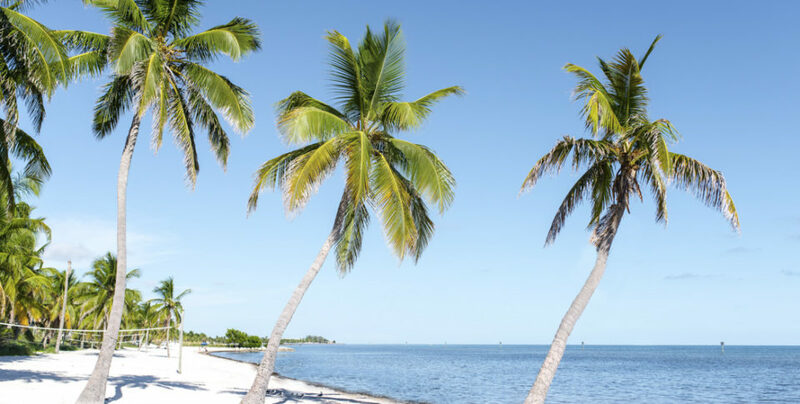 Here’s our guide to the best beaches in this stunning Florida Keys city. Soak in palm trees and sunshine at this quiet beach where you can spot stingrays and go snorkeling, paddle boarding and kayaking, and rent lounge chairs for the day. The beach also has a playground if you have little ones in tow and can pull them away from splashing in the ocean water. This beach is a great spot for families thanks to the shallow, clear water. The beach activity here is fairly subdued with a few stands selling drinks and food, but it’s the perfect spot if you want to swim or relax in the sand. Don’t be fooled by this beach’s smaller size; it’s one of the best spots to view the sunrise and sunset in Key West. Go for sunset and say for night yoga on the deck at this picturesque beach. Spend a day at this two-mile stretch of coastline where you can swim, kayak or parasail in low current waters and play volleyball on the soft sand public beach. Smathers Beach offers restrooms and lounge chairs so you can make a day of it with your family. This spot (known simply as Fort Zach by residents), the only natural beach in Key West, is beloved by local and visitors for its sand made up of ground coral and pristine conditions for snorkeling and diving where you can catch sight of the area’s marine animals. Ranger guided tours of the Fort leave daily at noon or you can hike Sand Hog Trail or Fort View Trail on your own. If you’re willing to go slightly further afield from Key West (to the tune of 30 miles), you’ll be rewarded with otherworldly views from this stunning white-sand beach. Snorkeling here is unparalleled thanks to the clear, shallow waters You can even camp overnight on the beach with sites that have water and electricity.